11 A None No Power Seat 11 A is a Royal Silk Business Class Bulkhead seat. Proximity to the galley may be bothersome. Passengers with infants are often seated here. 11 B None No Power Seat 11 B is a Royal Silk Business Class Bulkhead seat. Proximity to the galley may be bothersome. Passengers with infants are often seated here. 11 E None No Power Seat 11 E is a Royal Silk Business Class Bulkhead seat. Proximity to the galley may be bothersome. 11 F None No Power Seat 11 F is a Royal Silk Business Class Bulkhead seat. Proximity to the galley may be bothersome. 11 J None No Power Seat 11 J is a Royal Silk Business Class Bulkhead seat. Proximity to the galley may be bothersome. Passengers with infants are often seated here. 11 K None No Power Seat 11 K is a Royal Silk Business Class Bulkhead seat. Proximity to the galley may be bothersome. Passengers with infants are often seated here. 16 A None No Power Seat 16 A is a Royal Silk Business Class seat. This row does not have a window. 16 K None No Power Seat 16 K is a Royal Silk Business Class seat. 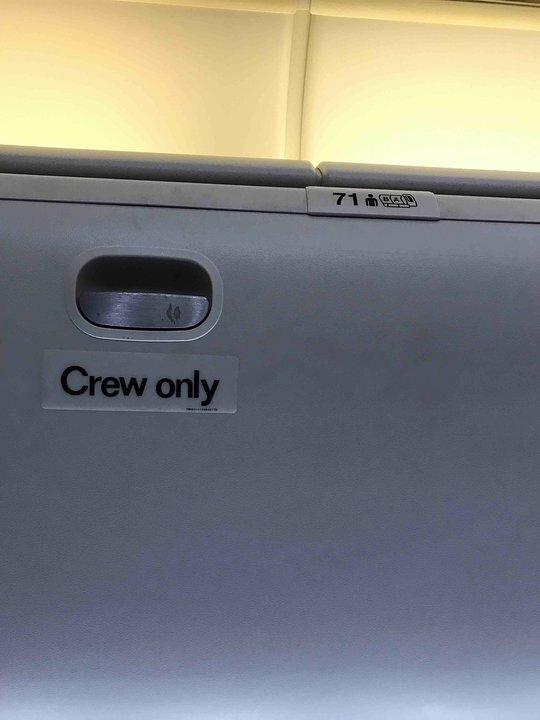 This row does not have a window. 31 A None No Power Seat 31 A is an Economy Class Bulkhead seat with extra legroom. Proximity to the galley and lavatory may be bothersome. The tray table is in the armrest, making the armrest immovable and slightly reducing seat width. There is no floor storage during take-off and landing. Passengers traveling with infants are often seated at this bulkhead. 31 B None No Power Seat 31 B is an Economy Class Bulkhead seat with extra legroom. Proximity to the galley and lavatory may be bothersome. The tray table is in the armrest, making the armrest immovable and slightly reducing seat width. There is no floor storage during take-off and landing. Passengers traveling with infants are often seated at this bulkhead. 31 C None No Power Seat 31 C is an Economy Class Bulkhead seat with extra legroom. Proximity to the galley and lavatory may be bothersome. The tray table is in the armrest, making the armrest immovable and slightly reducing seat width. There is no floor storage during take-off and landing. Passengers traveling with infants are often seated at this bulkhead. 31 D None No Power Seat 31 D is an Economy Class Bulkhead seat with extra legroom. Proximity to the galley and lavatory may be bothersome. The tray table is in the armrest, making the armrest immovable and slightly reducing seat width. There is no floor storage during take-off and landing. Passengers traveling with infants are often seated at this bulkhead. 31 E None No Power Seat 31 E is an Economy Class Bulkhead seat with extra legroom. Proximity to the galley and lavatory may be bothersome. The tray table is in the armrest, making the armrest immovable and slightly reducing seat width. There is no floor storage during take-off and landing. Passengers traveling with infants are often seated at this bulkhead. 31 F None No Power Seat 31 F is an Economy Class Bulkhead seat with extra legroom. Proximity to the galley and lavatory may be bothersome. The tray table is in the armrest, making the armrest immovable and slightly reducing seat width. There is no floor storage during take-off and landing. Passengers traveling with infants are often seated at this bulkhead. 31 H None No Power Seat 31 H is an Economy Class Bulkhead seat with extra legroom. Proximity to the galley and lavatory may be bothersome. The tray table is in the armrest, making the armrest immovable and slightly reducing seat width. There is no floor storage during take-off and landing. Passengers traveling with infants are often seated at this bulkhead. 31 J None No Power Seat 31 J is an Economy Class Bulkhead seat with extra legroom. Proximity to the galley and lavatory may be bothersome. The tray table is in the armrest, making the armrest immovable and slightly reducing seat width. There is no floor storage during take-off and landing. Passengers traveling with infants are often seated at this bulkhead. 31 K None No Power Seat 31 K is an Economy Class Bulkhead seat with extra legroom. Proximity to the galley and lavatory may be bothersome. The tray table is in the armrest, making the armrest immovable and slightly reducing seat width. There is no floor storage during take-off and landing. Passengers traveling with infants are often seated at this bulkhead. 38 D None No Power Seat 38 D is a standard Economy Class seat that may have restricted legroom due to the presence of an entertainment equipment box. 47 A None No Power Seat 47 A is an Economy Class seat, however this seat may not recline due to the wall behind. Close proximity to the lavatory may be bothersome as passengers tend to congregate in the area behind this seat. 47 B None No Power Seat 47 B is an Economy Class seat, however this seat may not recline due to the wall behind. Close proximity to the lavatory may be bothersome as passengers tend to congregate in the area behind this seat. 47 C None No Power Seat 47 C is an Economy Class seat, however this seat may not recline due to the wall behind. Close proximity to the lavatory may be bothersome as passengers tend to congregate in the area behind this seat. 47 H None No Power Seat 47 H is an Economy Class seat, however this seat may not recline due to the wall behind. Close proximity to the lavatory may be bothersome as passengers tend to congregate in the area behind this seat. 47 J None No Power Seat 47 J is an Economy Class seat, however this seat may not recline due to the wall behind. Close proximity to the lavatory may be bothersome as passengers tend to congregate in the area behind this seat. 47 K None No Power Seat 47 K is an Economy Class seat, however this seat may not recline due to the wall behind. Close proximity to the lavatory may be bothersome as passengers tend to congregate in the area behind this seat. 48 D None No Power Seat 48 D is an Economy Class seat, however this seat may not recline due to the wall behind. Close proximity to the lavatory may be bothersome as passengers tend to congregate in the area behind this seat. 48 E None No Power Seat 48 E is an Economy Class seat, however this seat may not recline due to the wall behind. Close proximity to the lavatory may be bothersome as passengers tend to congregate in the area behind this seat. 48 F None No Power Seat 48 F is an Economy Class seat, however this seat may not recline due to the wall behind. Close proximity to the lavatory may be bothersome as passengers tend to congregate in the area behind this seat. 50 D None No Power Seat 50 D is an Economy Class Bulkhead seat with extra legroom. Proximity to the lavatories may be bothersome. There is no floor storage during takeoff and landing. The tray table is in the armrest, making the armrest immovable and slightly reducing seat width. Passengers with infants are usually seated here. 50 E None No Power Seat 50 E is an Economy Class Bulkhead seat with extra legroom. Proximity to the lavatories may be bothersome. There is no floor storage during takeoff and landing. The tray table is in the armrest, making the armrest immovable and slightly reducing seat width. Passengers with infants are usually seated here. 50 F None No Power Seat 50 F is an Economy Class Bulkhead seat with extra legroom. Proximity to the lavatories may be bothersome. There is no floor storage during takeoff and landing. The tray table is in the armrest, making the armrest immovable and slightly reducing seat width. Passengers with infants are usually seated here. 60 C None No Power Seat 60 C is an Economy Class seat that juts into the aisle and is often bumped by service carts and other passengers during flight. 60 H None No Power Seat 60 H is an Economy Class seat that juts into the aisle and is often bumped by service carts and other passengers during flight. 61 A None No Power Seat 61 A is located in the last row of the aircraft. The proximity to the lavatory and galley may be bothersome as passengers tend to congregate in this area. 61 B None No Power Seat 61 B is located in the last row of the aircraft. The proximity to the lavatory and galley may be bothersome as passengers tend to congregate in this area. 61 D None No Power Seat 61 D is located in the last row of the aircraft. The proximity to the lavatory and galley may be bothersome as passengers tend to congregate in this area. 61 E None No Power Seat 61 E is located in the last row of the aircraft. The proximity to the lavatory and galley may be bothersome as passengers tend to congregate in this area. 61 F None No Power Seat 61 F is located in the last row of the aircraft. The proximity to the lavatory and galley may be bothersome as passengers tend to congregate in this area. 61 J None No Power Seat 61 J is located in the last row of the aircraft. The proximity to the lavatory and galley may be bothersome as passengers tend to congregate in this area. 61 K None No Power Seat 61 K is located in the last row of the aircraft. The proximity to the lavatory and galley may be bothersome as passengers tend to congregate in this area. Audio onDemand is available at every seat with 100 music albums and 31 games. Personal televisions with Audio and Video onDemand are available at every seat. 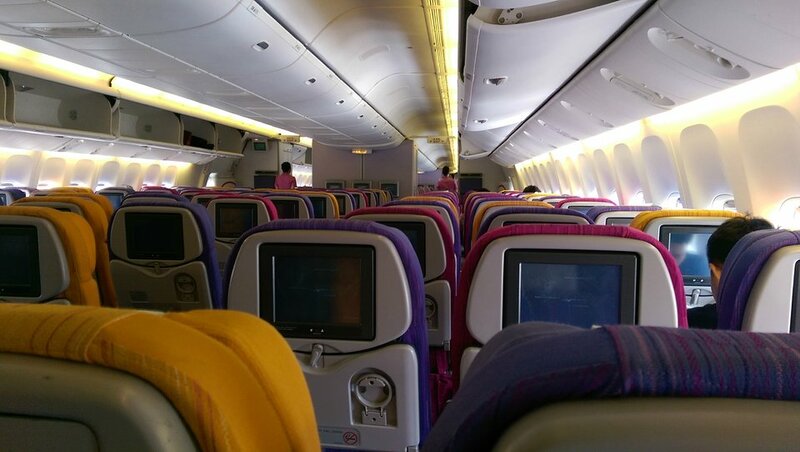 Business Class seats have a 15" screen and Economy Class seats have a 9" screen. Entertainment options include 30 movies and TV programs. Each Business Class seat and every other Economy seat has a 110v AC power port that does not require an adapter. Thai's B777-200ER aircraft is equipped with two classes of service: Royal Silk Business and Economy. Business Class is equipped with 30 capsule style seats from rows 11-16 and Economy Class has 262 seats from rows 31-61. The Royal Silk seating offers lumbar support and massage features for Royal Silk Class. There are foot rests for the seats in all classes. All seats have an AVOD entertainment system and a 110-volt AC power port. MEL to BKK. All seats have an entertainment box under the seat in front which severly limits space for legs. Flight attendants where very attentive and friendly. 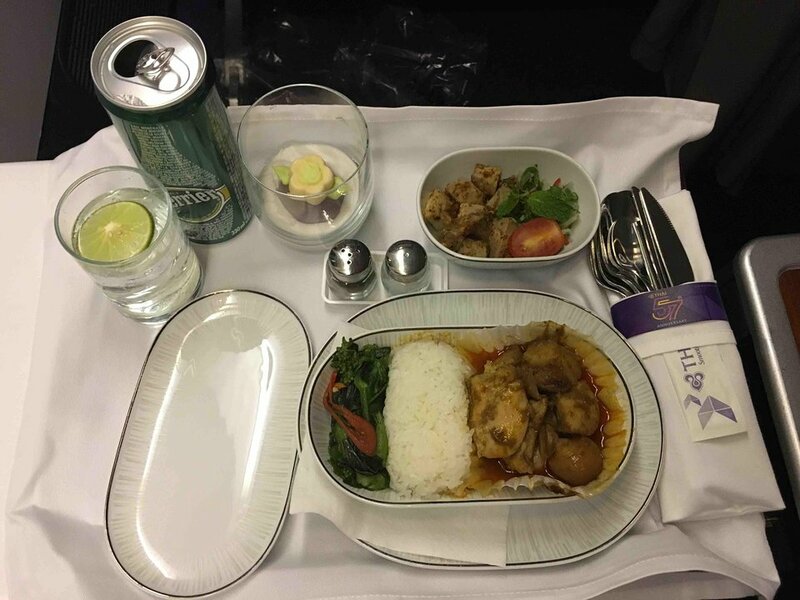 Food ok, beverages served throughout the flight. 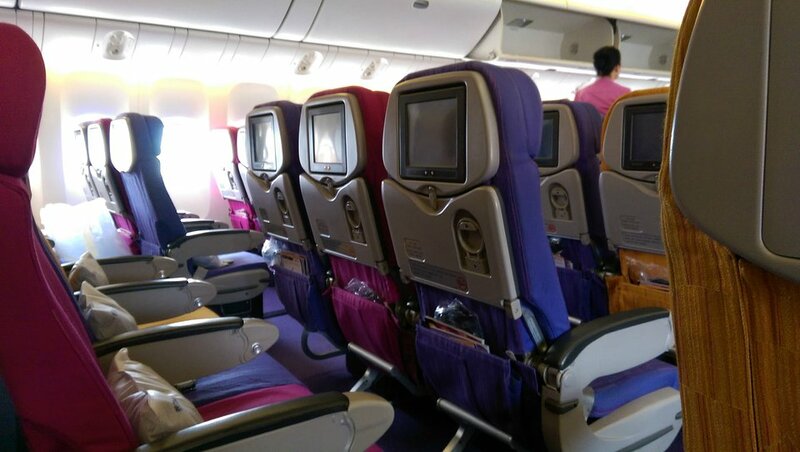 I sat in this seat going to Australia and coming back from Australia. Excellent seat. I was worried about the toilet noise, but it wasn't a big issue. Seemed to have more legroom than when I've sat in the other economy seats on these type of Thai planes. Seat has the full recline that other economy seats have. I would choose this seat again. THAI flies 1 versions of Thai Airways Boeing 777-200ER new.